One of America's most timeless couples is Mickey and Minnie Mouse. Walt Disney World is a place full of romance. Couples flock to Walt Disney World, making it America's most popular honeymoon destination. Since many couples marry around Valentine's Day, INTERCOT would like to spotlight activities around the resort that would make sweethearts fall even more in love. The Grand Floridian Resort offers a specialized way of spending Valentine's Day: being pampered together! Inside the Grand Floridian Spa and Health club, massages and facials abound, especially in the candlelit "couple's room", where each person receives a custom aromatherapy massage. Visit INTERCOT's Grand Floridian pages for more Spa selections. For ultimate romantic moments, a private dinner for two is in order. If you are at the Grand Floridian, you can have dinner on the beach gazing at Cinderella's Castle. Simply call private dining from any phone on the resort. For the ultimate in Walt Disney World dining, be sure to check out Victoria and Albert's, honored with a five-diamond award from AAA. Only 18 tables are served on Royal Doulton China and Sambonet silver while perusing personalized menus. There is even a Chef's table with special service by Chef Scott Hunnel. Call (407) WDW-DINE to set up this special meal of a lifetime. Info Central has a large array of sample Menus to help with your dining decisions. Don't forget to check the times guides found in the parks or at you resort hotel front desk for fireworks and night-time event schedules for the perfect meal timing. If a night of watching the Magic Kingdom fireworks while floating on a yacht sounds romantic, you might want to try booking the Grand 1, the 45 footer located at the Grand Floridian. You could even bring along 10 friends and make it a sweetheart party of 12. How about a private butler dishing out a gourmet meal? All this can be yours starting at $350 per hour, including captain and private deck hand. For something not quite so pricey, try the Yacht and Beach Club Resort Marina, where you can find "Breathless", a 1930 Mahogany runabout. For up to 7 people, 10 minute excursions are $23.58, 30 minutes are $80.18. The real treat for $179.20 would be an Illuminations Cruise traveling across Crescent Lake to Epcot for the spectacular sound, lasers, and fireworks. Call (407) 939-7529 to book in advance or for more information click here. For the folks with the smaller budgets, be sure to check out the special Valentine's Day merchandise located at the World of Disney and the Emporium at the Magic Kingdom. The Disney merchandisers have pulled a few things out of their hats just for Happy Hearts' Day. Also, be sure to check out special Valentine souvenir mugs at selected Magic Kingdom's counter service locations and popcorn stands. 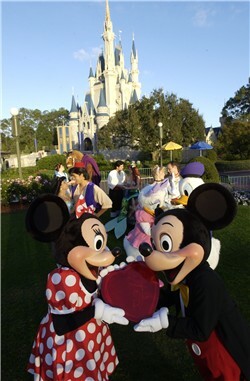 Romantic cards can be purchased at most Walt Disney World resorts, and a Valentine in front of the castle can be extra special. If you are more creative, writing special notes for your loved one can have greater meaning in a garden of roses around Fantasyland. Speaking of roses, the Walt Disney Florist can deliver just for you! Special packages include Mickey's Romantic Moments: Asti Spumanti with exclusive wine flutes, aromatherapy bath sets with beads, a Mickey towel and candle all within a unique Mickey signature basket. Special vases and arrangements will be available for Valentine's Day and can be ordered beginning the last week in January. For getting back to nature with your loved one, the Fort Wilderness Resort offers 45-minute horseback tours through the pines. Private carriage rides are also available. Tours occur only a few times per day, so be sure to call (407) 939-7529 to reserve your horse. Detailed information can also be found here. Did you know there were lots of opportunities to have your picture taken with character 'couples' in the parks? Mickey and Minnie of course, but there are also Aladdin and Jasmine (Morocco), Beauty and the Beast (France). Which couple do you model yourself on? Looking for a quiet spot with your partner? There are lots of little nooks in all the parks but if you venture to the resorts then pay a visit to Martha's Vineyard at the Beach Club one evening and you will find a delightful wine bar with comfy seats and very little company. Perfect for couples!